There is a major land crisis in Cambodia, a leading United Nations human rights official has said. The special rapporteur on adequate housing, Miloon Kothari, spent the past two weeks travelling around Cambodia. He said that rich and powerful interests were grabbing land, leaving thousands of people dispossessed. Over the past year land deals have been an increasing source of controversy, but this is the first time they have gained international attention. The UN official has been to several disputed sites. 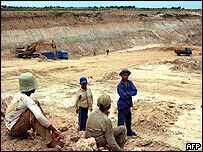 They include a village in Poipet near the Thai border where five people died during forced evictions, and a river island in Phnom Penh, whose inhabitants are under pressure to sell up to a property developer. Mr Kothari is particularly concerned about the practice of land swaps. In recent months, dozens of publicly owned facilities have been given to private companies for redevelopment without any bidding process. The companies are supposed to build new public facilities and housing in return, but Mr Kothari said they were using poor land which did not have access to electricity or running water, and thousands of families had been displaced. He is asking for more transparency in the government's dealings. "There is a frenzy now across the country by the rich and powerful in Cambodia to acquire land. I think the donor communities and the UN agencies need to be much more outspoken. What I find missing here is a sense of outrage that should be there," he said. Cambodia's Prime Minister, Hun Sen, announced a moratorium on land swaps at the beginning of June, but deals are still coming to light. Last week, the interior ministry announced that part of Phnom Penh's royal palace had been given to a property developer. What do you think of the land controversy in Cambodia? Have you been affected or do you know of people affected by land swaps? Send us your comments and experiences.